What was needed was a innovative interface, we needed a paradigm shift, and it's possible that BumpTop (via Second Life Insider) might be it. Watch the video, it'll explain the interface a lot better than I could in words, but in summary "Why didn't I think of that..."
Of course if you took the multi-touch hardware interface from the new Apple iPhone and combined it BumpTop with a tablet form factor, and maybe you've got something. Anyone paying attention over at Apple..? Developers are looking at Flash and at AJAX as platforms for rich desktop applications. If Java becomes irrelevant... then we will enter a new phase in it's life. There will be plenty of uses for Java for a good long while but we are entering the Fortan phase or the COBOL phase. The one thing missing from the recently announced iPhone that would change it from merely a "must have" to a "will kill for" gadget, well apart from the ability for me to develop third party applications, is GPS. So the announcement that GPS and Bluetooth will soon be available on a single chip is somewhat reassuring. Having come this far Apple surely won't stumble at the final hurdle, will they? In the wake of the iPhone announcement last week rumours of a replacement for Apple's 12-inch Powerbook are once again circulating. However this time people are talking about a touch screen interface or a full blown tablet Mac. Are they mad? I spend three quarters of my life sitting in-front of a computer, its what I do, and I'm sure I'm not the only one to scream in horror at the thought of loosing the tactile feedback from a real keyboard in exchange for a touch screen. However what they seem to be missing is the trackpad, why do we need it anymore? The multi-touch technology of the iPhone is far in advance, and much more intuitive, than any trackpad I've ever used including Apple's own scrolling version. So why not get rid of the track pad entirely and make the screen the real interface? Hang onto the keyboard, any decent typist beyond the hunt and peck stage isn't going to like it going away, but the track pad? Nobody likes track pads, or most, if any of the alternatives. No track pad, and we're that much closer to the light weight 12-inch replacement I've been hoping we'd see for a while now. Apparently the new Virgin mobile TV service released last February isn't proving to be particularly popular, with less than 10,000 subscribers. This really doesn't surprise me, I've never been able to figure out why people would want TV on their mobile phone, despite the industry thinking it was the next killer application to drive traffic over their networks. Remember pocket TVs? I have to shamefully admit to owning one of these little devices sometime in the late 80's, and it was totally useless. While technology has changed a lot, I can't see twenty years having changed how humans behave all that much. Mobile TV isn't a killer application, unless what its supposed to kill is the networks. Totally overshadowed by the release of the Apple iPhone something else snuck onto the Apple Store while we weren't looking. Apple's Airport Extreme Base Station has also received a face life to match the Apple TV and Mac Mini. The big news however is that it supports the 802.11n protocol, and while you'll have to have an 802.11n compatible Airport card in your machine to take full advantage of this new hardware, the current generation of Macbook Pros are of course currently shipping with just that. The new base station will ship in February, and is priced at £119. Update (08:55PST): The VIP's have been let into the hall, but everyone else is still in line outside the hall waiting for the keynote. The conjecture is that something may have gone wrong during rehersals, its looking unlikely that things are going to start on time. Update (09:10PST): Although some people are still taking their seats, it looks like they're starting, people are now being told to turn off their cellphones and other devices. Update (09:15PST): It looks like I'm not the only one using Blogger as the new beta isn't performing that well right now, I'm getting a really poor response out of the interface and am having publishing troubles. Update (09:19PST): "We're only talking about the Mac today..." and "We're going to make some history together today...", which is an interesting lead in to the keynote. This must mean that we're not going to see an iPhone after all? Update (09:24PST): Talking about the iPod and how successful its been, and how unsuccessful the Microsoft Zune has turned out to be, with only 2 percent of the market share. The new "Apple TV", looking the same as before. Update (09:37PST): Moving on to the iTV it looks the same but is now called the "Apple TV". It offers 720p HD resolution, a 40GB hard drive, 802.11 wireless supporting all three (b,g and n) standards and an Intel processor. Video, photo and audio content can auto-synched with one PC, but streamed from up to five computers. Will have RCA component, USB2, Ethernet, and HDMI ports. Update (09:43PST): Here we go! Steve has just announced a widescreen iPod with touch controls, an Apple mobile phone, and a breakthrough internet communications device... all in one device.I'm totally knocked to the floor, we've been waiting for this for two years, but nobody really predicted it all be in one device. Update (09:54PST): Interestingly the news is that the device isn't running a custom operating system, its going to be running Mac OS X? It's slim, 11.6 mm with a built in 2 megapixel camera. Solving all of the problems, all of the time? Update (09:58PST): Steve is making a lot of the user interface, claiming its five years ahead of the crowd. The device has an accelerometer, and can tell whether its being held in portrait or landscape mode. Update (10:12PST): The iPhone is also an iPod of course and it offers widescreen video, with the new Cover Flow interface and full 3D effects and full-screen album art. The "best iPod we've ever made..." says Jobs. It's got 8GB of storage though, which seems somewhat low? Update (10:21PST): The phone has a full Safari web browser, which supports rich HTML such as Google Maps. Yahoo to provide free Push IMAP email service for iPhone users, so much for the Blackberry, and the phone will support both IMAP and POP email. The device should switch between WiFi and GSM connections seamlessly for data. Update (10:29PST): The device also supports widgets. Does this mean we can just take our Dashboard widgets and drop them directly onto the new phone? If so then they've just become infinitely more important, writing software for mobile phones is traditionally a very hard thing to do, but writing Dashboard widgets is relatively easy. Update (10:35PST): Google Maps is apparently heavily integrated into the phone (not via the normal browser?) and Apple has been working closely with Google on this one. Eric Schmidt, Google's CEO, appears briefly on stage followed closely by Jerry Yang, Yahoo's CEO, who both say nice things about Apple. Update (10:45PST): Accessories will include stereo headphone, the same set that currently ships with the iPod, but with a tiny microphone built-in and an incredibly small bluetooth headset which automatically pairs with the iPhone. The predicted battery life is 5 hours while talk/video browsing, or 16 hours for playback of audio. Critically he hasn't mentioned the standby time, something which is really important when it comes to phones! Update (10:48PST): Expensive! The 8GB model is US$599 while the 4GB model is US$499 and will be available in June from both Cingular and Apple stores, but only in the States and only with a two year lock in contract with Cingular. But the good news is that the phone will also be available this year in Europe by Q4 and in Asia by 2008. No mention of partners, although hopefully Apple realise that a two year lock in contract isn't going to fly over here no matter who they partner with? Stan Sigman, Cingular's CEO, appears briefly on stage. Update (11:01PST): Steve is changing the company name from "Apple Computer Inc." to "Apple Inc." to reflect the fact that they now make a lot of devices that aren't really computers. That really shows how seriously Apple is taking the move towards consumer devices. Wrapping up now, but is there going to be "one more thing"? Update (11:07PST): Doesn't look like it, does it? I think it's interesting what we didn't see; a ship date for Leopard, or a new iWork or iLife release. There also wasn't any computer hardware outside the new iPhone, or a .Mac updates or revisions. With thanks to Apple Matters, iLounge, TUAW, Engadget, Mac Rumours and UNEASYsilence. I don't really understand why Apple are still shipping laptops with an optical drives. Actually I don't really understand why anyone is shipping laptops with CD or DVD drives or writers anymore, low cost flash disk have made them as much yesterday's technology as floppy disks. When I can have a 4GB USB flash drive for only £24.99 remind me why I want a DVD burner? So replacing the optical bay with another hard drive on a Macbook or a Macbook Pro seems like a decent idea to me, even if it does inevitably rip your warranty to shreds. You have to give it to Jeff Bezos, he's managed a top flight skunk works project and kept it out of the media to an astonishing degree. Despite the relative secrecy surrounding places like Scaled Composites and Virgin Galactic, or for different reasons Bigelow Aerospace, I've got an educated outsiders idea of what's probably happening on the inside. Of course places like Armadillo Aerosapce are running with a fairly open business model to begin with, but not Bezos' Blue Origin. Blue Origin's Goddard vehicle, the first sub-scale development vehicle in the New Shepard programme, coming out of the "barn" before its launch from Van Horn, west Texas, early in the morning of November 13, 2006. On the 7th of November last year the FAA issued a NOTAM for a series of test flights by Blue Origin between 10th to the 13th of November. While the first test was reported to have taken place on the 13th, at 6:30 am local time (12:30 UTC), very little was actually known as to what happened other than the test flight was judged successful, and the vehicle had reached an altitude of 285 ft. So the story on BBC news today which gave the first details I've seen of the test flight of Blue Origin's New Shepard, a vertical take-off, vertical-landing vehicle, came as a surprise. They're a lot further on than I, or I guess a lot of other people, thought they were. They seem to have replicated a good deal of the work done by McDonnell Douglas on the DC-X programme and might even have push beyond that, perhaps we should have expected this as the rumour is that several of the engineers who worked on the DC-X have since been hired by Blue Origin. Update: There is a good article over at MSNBC covering the flight, and they've come pretty much to the same conclusion I did. That Bezos' has only released this footage so that he can recruit some new people with heavy lifter experience. He's looking for people with experience with Delta IV or Atlas V, and those aren't small vehicles. Blue Origin isn't in the sub-orbital business like Scaled Composites and Branson, no matter what Bezos is saying right now they're playing a longer game and working towards an full blown single stage to orbit lifter. Update: I just dug up the environmental impact statement (19.5MB, PDF) from the FAA's web site. I'm not going to trawl through the 200+ pages in too much detail, but it does confirms its use of a high-test peroxide mono-propellant which is something I was wondering about as the burn looked way too clean to be a bi-propellant. As always in the lead up to Macworld, the rumour mill must roll. 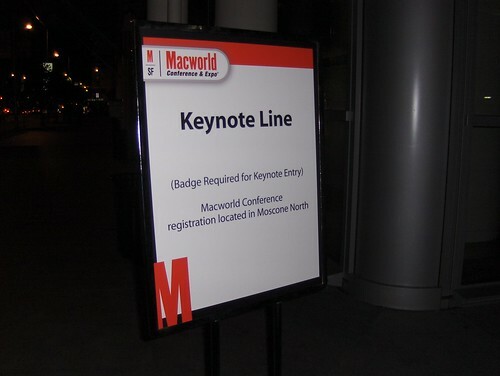 It looks like this year TUAW is leading the pack with their predictions for Macworld 2007. However the mill has been spun up to full speed by the teaser image now being displayed on the Apple website. As Mac Rumors points out this is the first time that Apple have run a pre-Macworld teaser since 2002 which brought the arrival of the first flat panel iMac, the 14-inch iBook and the arrival of Mac OS X as the standard boot OS for Apple hardware. Are we really looking at something as dramatic as that next week? On Friday the 13th, April 2029 the asteroid 2004 MN4 will make its closest approach to us and, despite the conspiracy theorists, it will miss the Earth by some 18,600 miles. However that's well inside geosynchronous orbit at 22,300 miles, and one of the closest approaches we've seen yet. It's always suprised me that the Shoemaker-Levy 9 impact with Jupiter in 1994 didn't cause more comment. After all, what sensible species would watch a rock the size of a large mountain strike a nearby planet and then make only token gestures about doing anything about it?